Includes all curriculum areas, Decoratives, Teacher Tools, Incentives, Early Childhood, Games, Music, Active Play, Multilingual Education, and Middle School. For quantities above 5,000, please call for quote. Contains all of The Scholar offerings plus Furniture, Carpets, Classroom Technology, and Special Needs. Includes Daycare/Preschool Furniture, Carpets, Blocks & Construction Play, Manipulatives, Special Needs, Language & Literacy, Dramatic Play, Active & Outdoor Play, and more. Use Manufacturer Co-op to offset cost – ask us how! *Add $125 fee to imprint. Perfect size for Teacher Desk Calendars, Posters and Bulletin Board Sets! For quantities above 10,000, please call for quote. 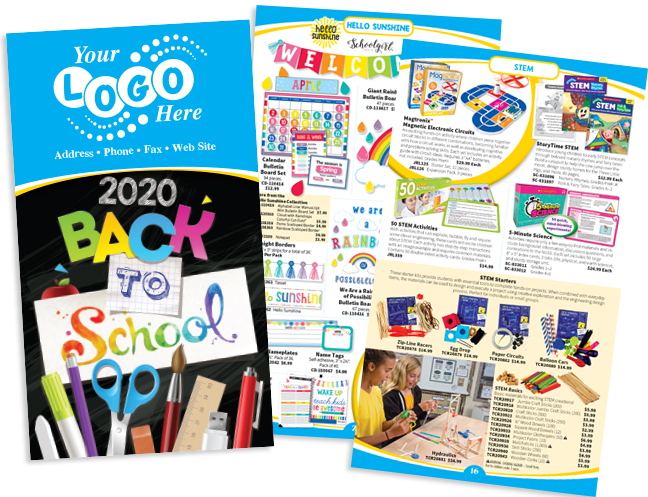 An affordable, 100 page comprehensive catalog that will showcase School Equipment and Furniture. Consisting of open lines providing a product range from Common Area/Lounge environment to Early Childhood. Classroom Technology section spanning storage and charging stations to listening centers. For quantities above 2,000, please call for quote.